Yesterday Ian and I did our most ambitious hike yet: the Fort to Sea, from Sunset Beach to Fort Clatsop and back. I call it a hike, but in places it was much more of a stroll, a walk, a perambulation, or a tromp. Here we are at the start, feeling fresh and frisky. 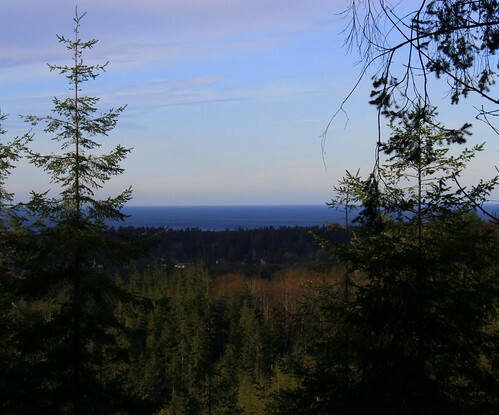 Then, after tunneling under Highway 101, we transitioned into a some more woods and farmland. 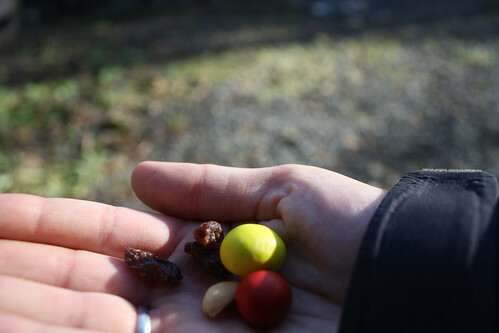 Good thing some genius invented trail mix. Ian carried the trail mix baggies in his jacket pockets because we didn’t have a backpack and I had used all the extra space in my camera bag with 2 PB&Js and 2 apples. I also carried a water bottle strapped to the back of my camera bag (the tripod holder, when empty, fits a Nalgene perfectly! ), and Ian hand-carried another Nalgene. Next time, we’re bringing a proper backpack. After the farmland, we entered woods, but the trail remained well-maintained and graveled almost the whole way. 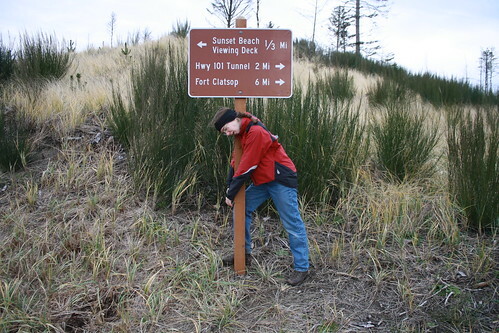 Almost immediately we found a nice pit toilet and signs: 3 miles to Ft. Clatsop; 3 miles to Sunset Beach. Halfway there, and they gave us a potty break! Then we followed a meandering stream along the side of a valley, eventually climbing to the top of the valley for an overlook. The overlook was about 2.5 miles from the ocean, but it looks very far away. We gazed out for a while, ate trail mix, and moved on. The trail changed to a wide graveled road that led us almost all the way down to the road. We cross the road, meandered for about 1/4 mile (just long enough for us to wonder whether we really were near the visitor’s center), and voila! When we went inside, one of the rangers asked if we had a national forest pass. We were confused: Why would we need a pass? We’d just walked here from somewhere else, didn’t plan on doing anything on national forest land, and intended to turn around and walk back. Once the ranger understood our plan, she agreed we didn’t need a pass after all, but she said she hoped we’d come back and see the fort some time. So now I’ve been by Fort Clatsop twice and never seen it yet. 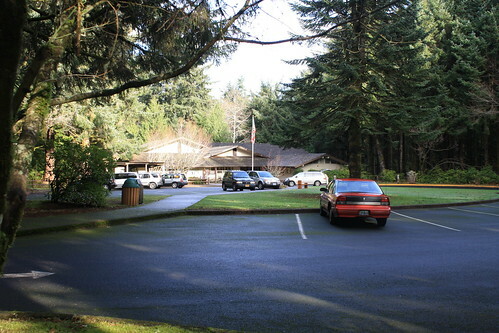 We used the visitor center’s facilities (aahhh, water to wash your hands! 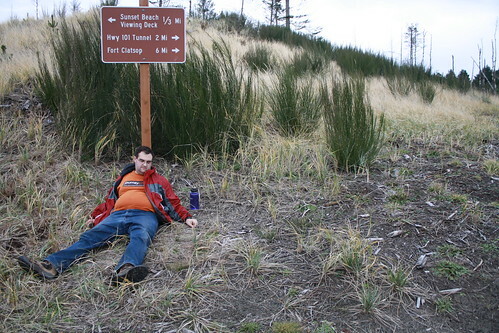 ), ate lunch, and did the whole hike again — backwards! Actually, we took a the Alder Creek Loop up to the outlook, but after that it was all the same, and we didn’t walk backwards at all. too risky. Instead we walked normally and talked about number theory and different types of elves in Middle Earth. 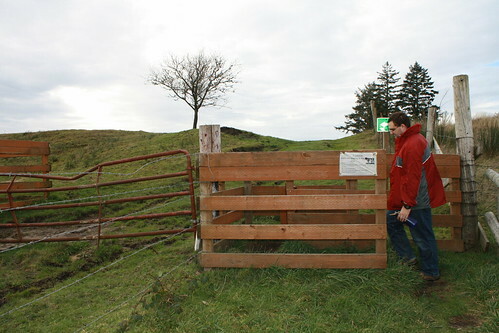 The cows had moved and were standing around one of the pass-throughs, which made us nervous. They kept eyeing us suspiciously, like they thought we’d come to steal their hay or something. We crept through carefully, only getting partly covered in 1:1 cow poop:mud goo. My boots need a good cleaning. 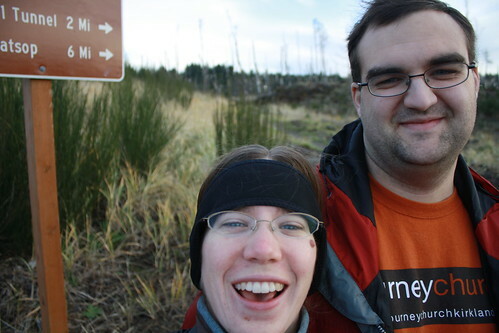 Overall we agreed the Fort to Sea trail was a really excellent one. 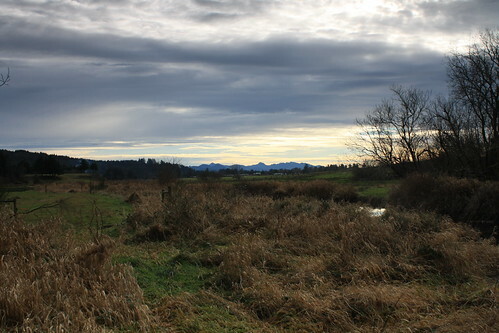 It had lots of different landscapes, from pastures — which you saw up close! — to lots of different types of forest to water meadow to regular meadow. Enough landmarks appeared along the way to keep it interesting, too. 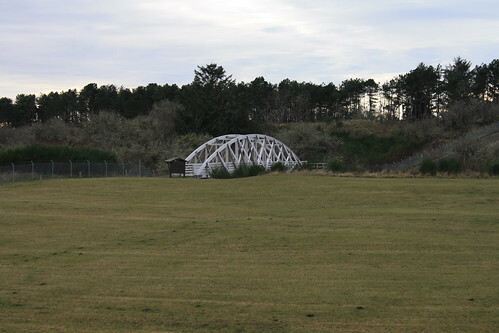 First you walk 2 miles and get to the Highway 101 underpass; then another mile and you get to the halfway bathrooms; another 1.5 miles takes you to the overlook, etc. It felt less like 6 miles each way than only a mile or mile and half to the next interesting point. Also, it was quite flat compared to the Tillamook Head hike, sticking closely to valleys and not needlessly hurtling over high points just for the heck of it. That made it a fairly easy 12 miles, coming in at just under 4 hours, excluding stops. I’m pretty sure we’ll be doing that hike again. Very pretty! I need to go hiking more. We could go for a hike while you and Jordan are up for Christmas! Just be sure to bring snow/wet weather clothes.